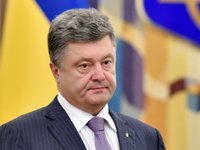 The results of a quick test of analyses of the candidate for the presidency of Ukraine, incumbent head of state Petro Poroshenko showed that there are no psychoactive substances in his body, the chief physician of the Kyiv City Narcological Clinic Sociotherapy, Volodymyr Yary, has said. "We used several methods of detecting psychoactive substances in the body. These were quick tests, the results of which I already have the opportunity to make public: not a single psychoactive substance was found," he said at a briefing in Kyiv on Friday.